Happy new Year! 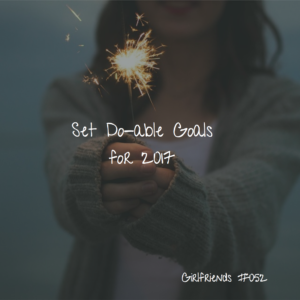 In this episode, we are talking about some doable ideas for goals we should all think about setting in 2017. Even if you are not a resolution-making kind of person (I’m not), we can all benefit from a prompting to look back at the year that has passed and look forward to the future with an eye to what we might like to happen. 1) Set a spiritual goal. 2) Set a professional goal. 3) Set a relationship goal. 4) Set a health goal. After you have decided what you might like your goals to be, let’s break them down into some smaller steps that you can take action on right away. For example, if you have a health goal of running a 5K in the spring, you can begin today by researching and starting a run/walk program of training to get you there. Or if you have a relationship goal of spending more time with your elderly aunt, call her up today and commit to a time this week that you can go visit her. Whatever your goals, make sure you move toward making them a reality right away. Let me know what your goals are for 2017 and how we can help support you in achieving them! This week, I also share a belated voicemail from listener David about taking kids to Midnight Mass. Let me know what you think!